Perhaps one of the most underrated drivers of his day, David Coulthard was perhaps my favorite personality on the Formula One grid during his tenure in the seat. His race craft was great to watch, even when Red Bull was among the worst teams on the grid. I read his 2007 book It Is What It Is and inexplicably loved every page of it. And besides all of that, he’s a square jaw Scottish dreamboat. What’s not to like about this guy? Oh, right, he said women can’t be good racing drivers. That’s not great. In a similar way that I can separate Kanye the man from Kanye the artist, I can still appreciate Coulthard’s driving despite his ridiculous words. 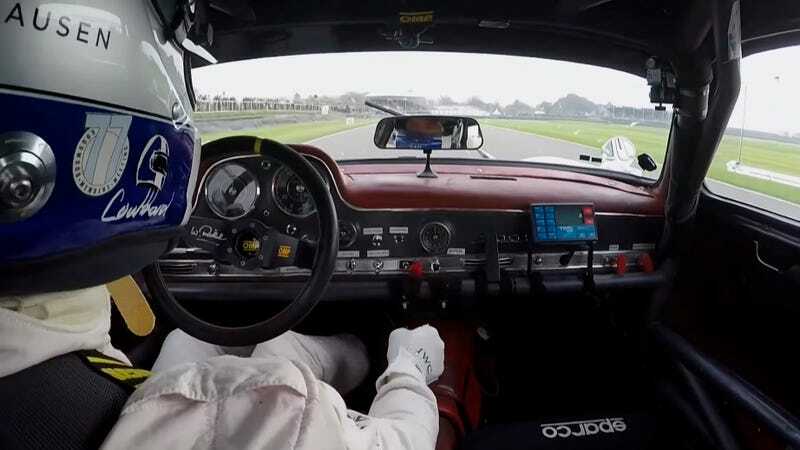 He hopped aboard the greatest Mercedes-Benz in history and ran some killer laps at the front of the grid during this weekend’s Goodwood Members Meeting, and he earned even more respect. With every high-rev dab of throttle, and every firm and decisive gearchange, Mr. Coulthard earned his place in the pantheon of great racers. With verve and aplomb he deftly maneuvers the Gullwing 300SL around Goodwood’s short but technically challenging course. While the gearshifts are sure and confident, the steering wheel takes a good bit of wagging to get the car pointed in the right direction. The combination of an oversteer happy chassis and vintage race-spec tires makes for an arm workout, even for the most seasoned drivers. This is the best onboard clip I’ve seen in quite some time, and I’m quite impressed with how the car and driver meshed. Well done DC, I’ll be watching this one again. Turn up your speakers, that divine Mercedes inline six deserves nothing less.